You can book your Washington DC hotel stay any time on our web site, and get great prices, ratings, and a large selection. You can also book hotels in nearby Maryland and Virginia. But did you know we also have a listing of current hotel deals? If you check out our hotel deal section, you can get even better prices at participating hotels. Check back often for new deals as the seasons change. 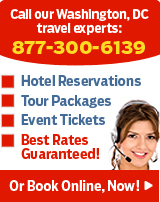 If you are planning on sightseeing, you can also save money by purchasing hotel packages. These include your hotel stay, and any added sightseeing tickets that you choose. The list of packages also changes over time, so come back and see what’s new the next time you are coming to town!